Halloween's over for another year...... there are way too many sweets in the house and the pumpkin shell has hit the composter. But did you know that the UK wastes 18,000 tons of food (specifically pumpkin) as a result of binning the flesh left over from carving jack o'lanterns. An article in the Ecologist equates this to the 'same weight as 1,500 double decker buses', which 'if made into pumpkin pie could make 360 million portions'. That is a staggering figure and frankly, as a nation, we should be collectively shamed by it. I am pleased to say that such appalling waste will not be tolerated in our house. We hate food waste. Pumpkins are bought from the local green-grocer...... felt for weight to ensure they are full of flesh....... and sourced for food and not specifically labelled as a designated 'carving' fruit.......... The shell that is carved is considered a by-product! Lengthy a process as it may be, when it comes to pumpkin, we carve with care and scrape and slice as much as we can from the pumpkin shell to use in the kitchen. This cake is so tasty....... It is dense and slightly chewy, but moist. 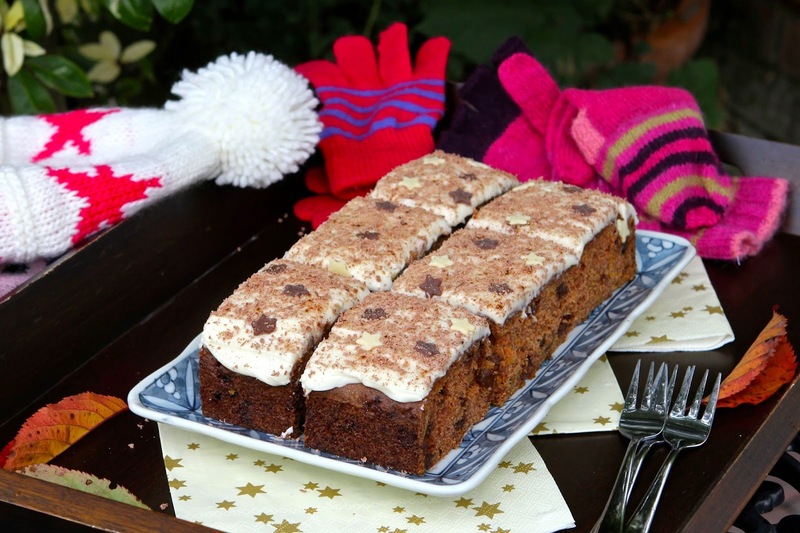 Rich in colour and spiced Autumn flavours, it is also packed full of chocolate chips and sultanas. There is absolutely no hint when you bite into it, that it contains any obvious pumpkin at all. I gave it to my daughter and she wolfed it down. I still haven't told her what is in it as I know this will sadly cloud her perception of deliciousness (kids can be so fickle!). It is a cake full of good stuff........ just consider the chocolate and icing as a naughty side-order and if you want to pass on either or both, the sponge really won't suffer for it. Throw in some nuts instead! Saturated with the aromas and exoticness of a good, warming Autumn bake....... cinnamon, ginger and citrus....... can you think of a better way to use up the orange flesh of that Halloween squash? And the timing couldn't be better either, to accompany the celebrations of Guy Fawkes this week. 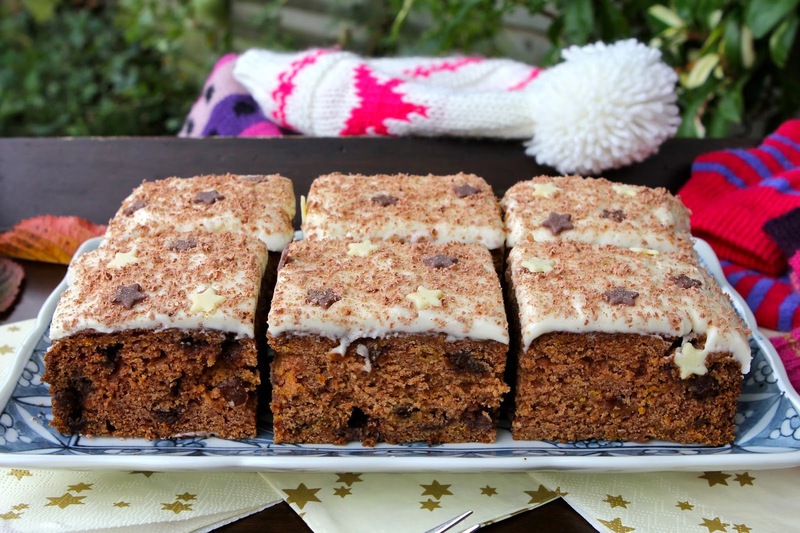 A perfect sweet offering to munch beside the bonfire, whilst watching sparkles and colours lighting up the night sky. The cream cheese frosting slathered across the top is infused with sweet vanilla and adds extra decadence as well as a contrast of texture. It is smooth and luscious, giving a rich, velvety feel to the whole experience of eating it. Random Recipes over at Belleau Kitchen. The lovely Dom has for November, challenged us to randomly select a recipe from all those magazines and clippings that litter the kitchen shelves (yes Dom..... I certainly have them!). I will be honest...... I specifically wanted to use up the pumpkin, so I picked up my most recent wodge of freebies and mags and skimmed through until I found the first recipe with 'pumpkin' in the header. My start point for this recipe came from Coeliac UK's 'Crossed Grain' magazine which is a fab resource for those with Coeliac disease and gluten intolerence, from health advice, through to campaigns, research, recipes and rights. I have taken their recipe for Pumpkin Cake and only massacred it a little. I did truly try to stick closely to it, but because I use my own home-blended gluten free flour, I had to adapt away from commercial GF blends, to include baking powder and xanthan gum. I didn't have any mixed spice, so I substituted with my favourites.... cinnamon and ginger (not far from the original then...). I pureed the pumpkin rather than grating it as I wanted a smooth, less grainy bake. And I changed the sugar, used less sultanas, threw in some chocolate chips and also some vanilla for good measure! Shop Local with Elizabeth's Kitchen Diary - The pumpkin was bought from our local, very traditional greengrocer and was sourced from a local farm. The Biscuit Barrel with Laura at I'd Much Rather Bake Than.... who is this month celebrating Winter Warmers. 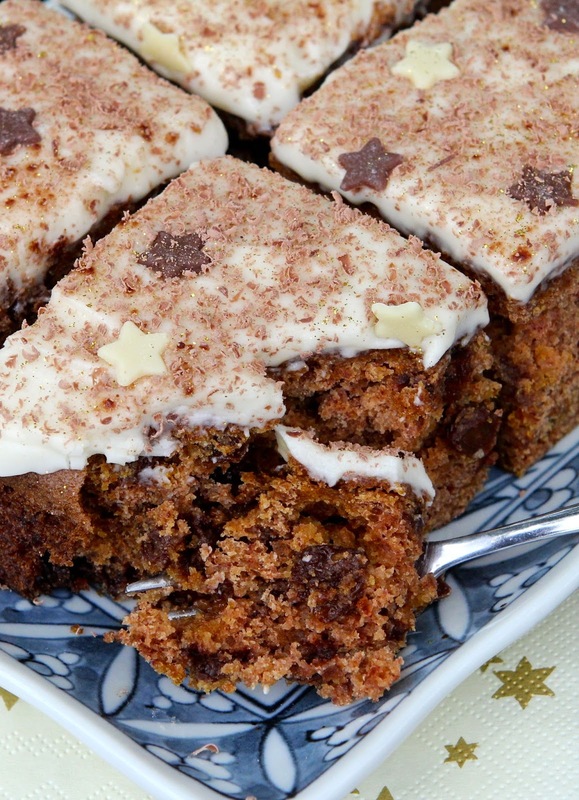 Packed with warming spices, this cake is a fantastically satisfying, comforting bake. Tea Time Treats with Janie over at The Hedge Combers and Karen from Lavender & Lovage. November's treats celebrate Bonfire Night, making this an ideal share. For the same reason, Love Cake with Ness over at Jibber Jabber..... November's theme being 'In With a Bang'. Extra Veg jointly hosted by Fuss Free Flavours and Utterly Scrummy. 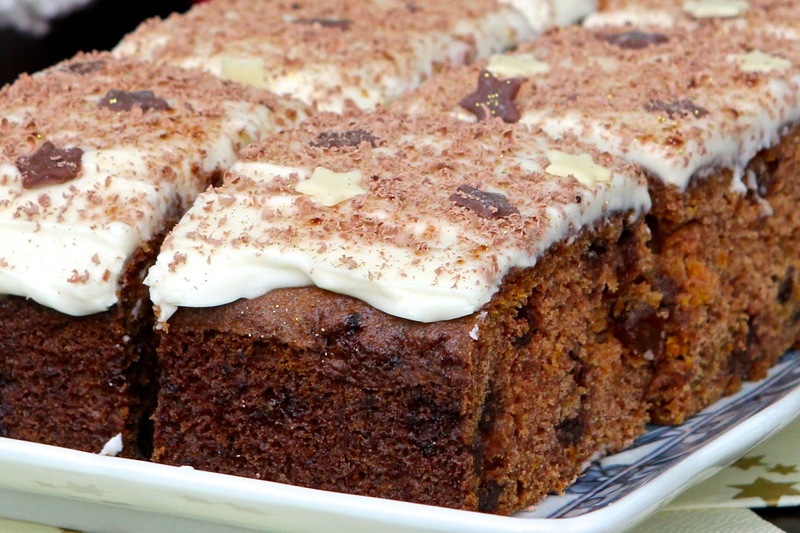 The pumpkin secretly hidden within this cake makes it almost virtuous! Cook, Blog, Share with Lucy at Supergolden Bakes. Simple & in Season with Katie at Feeding Boys and a Firefighter on behalf of Ren Behan. Base line a 25 x 25cm baking tin (7cm deep) with baking paper. Pre-heat the oven to 170 C/325 F/Gas 3. In a large bowl, mix together the flour, baking powder, bicarbonate of soda, xanthan gum, cinnamon, ginger, salt and sugar, making sure any lumps are completely broken down. In a heat proof bowl, gently melt the butter. Add the butter, and whisk again until thoroughly combined. Add the orange juice and vanilla extract and beat again. Add the butter mixture to the dry ingredients and stir to mix thoroughly. Bake for 30 to 40 minutes until the cake springs back to the touch and a skewer inserted into the centre comes out clean. Leave the cake in the tin for 10 minutes, before turning onto a wire rack to cool completely. Cream-cheese frosting : Beat together the cream cheese and butter and then add the vanilla extract and icing sugar a little at a time until the icing has begun to thicken. Place in the fridge until the cake is completely cold and then spread over the top of the cake. Thanks Ros. You can't go wrong with a handful of chocolate chips and the cream cheese frosting is way too addictive.... good job there is a bit of virtuosity in it! I have a pumpkin tea bread I make from time and time and agree that pumpkin is brilliant in cakes - also great in scones which I love - sadly my little girl has taken against pumpkin but with sugar I might just get it past her. That is astounding about the waste of pumpkins in the UK. The pumpkins we have in Australia has lots of flesh so I was really surprised to see one of those orange halloween pumpkins from america and see how thin the flesh is. Yet another reason to feel uneasy about halloween. Absolutely Johanna...... The carving pumpkins seem commercial pointlessness to me! It has to be a good fleshy useful pumpkin in my book. I was really surprised that my daughter didn't realise there was a hidden ingredient, so definitely a good way to sneak pumpkin past the little people! Pumpkin scones sound amazing!!!! Oooo this looks jam packed with flavour and comfort and warmth. And that icing too. Mmmmmmmm. Thanks for sharing with the Biscuit Barrel! Mmmmmmm indeed, Laura! you're welcome! I think I have to give it a go soon before all the pumpkins disappear! This sounds yummy - I wish I had some pumpkin left over to make it! Thanks Corina. It is (or was). I may have to go and seek another pumpkin to make it again! 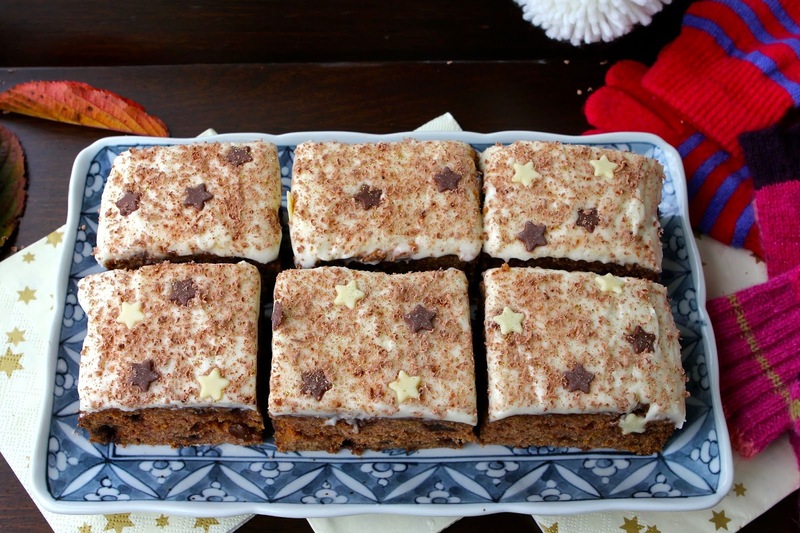 What a lovely looking cake - and I can never resist a cream cheese frosting! Thanks CC. I can't resist it either...... would happily sit with a big bowl of it and a spoon! That looks seriously good! I hate food waste too so when I sit down and do my weekly meal plan I always try to make sure I have recipes that use up everything I buy. Very little gets wasted here! 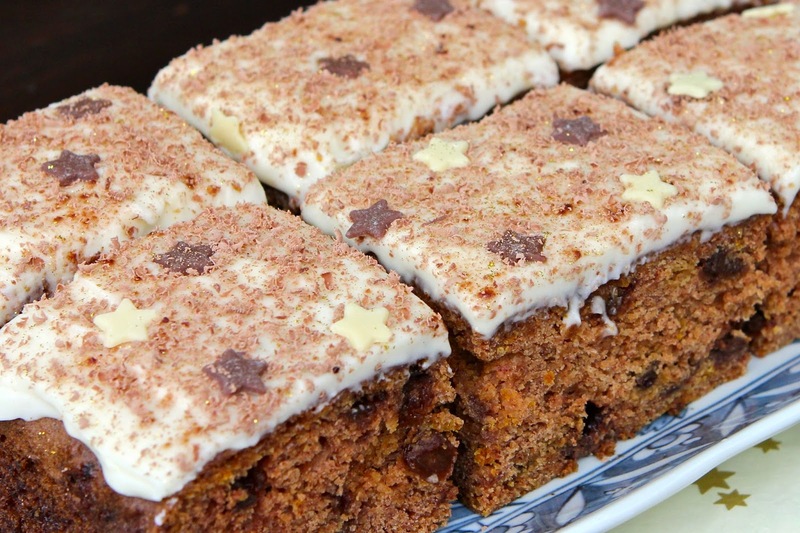 I love 'vegetable' cakes...they are so moist and pumpkin and butternut squash are fab because they are so naturally sweet. Yum! Thanks Vicki. I wish I could be that organised...... I tend to be more of an 'open the fridge door and take pot luck with the left-overs' sort of person.... Not that it makes much difference on the waste front...... we are pretty good at devouring everything in sight! Look moist and yummy. A lovely recipe Kate! Great combination pumpkin and chocolate. Thanks Alida..... it was extremely yummy! I will definitely be making it again! No worries Dom and thank you! Isn't cream cheese frosting to die for???? It was amazingly moist and way too moreish Janie. Despite the extra calories, I will nonetheless, absolutely be making it again!! Another beautiful recipe from you - you're such a culinary genius! Thank you for sharing with Shop Local. 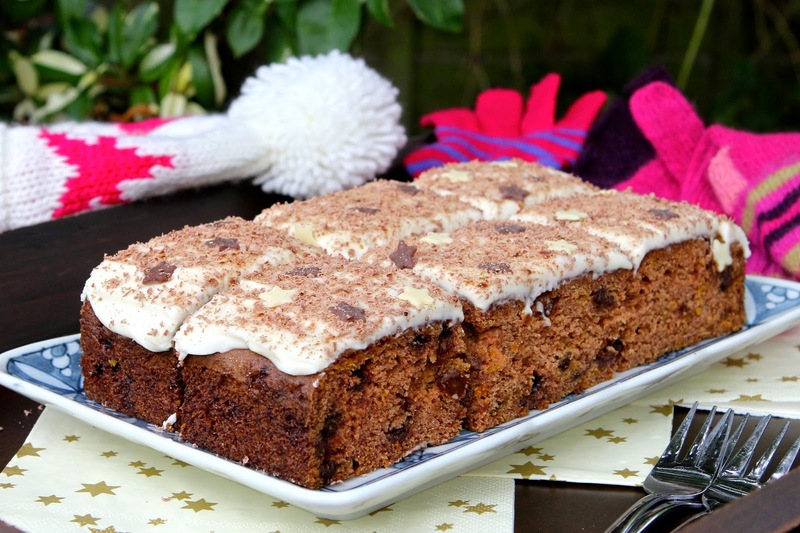 This cake would be perfect after time spent playing outdoors in the snow! Making Macarons - a first attempt!